It has been another busy week. This working in the office business is high pressure, you know! Actually, it’s not exactly pressured, just really, really long days which get boring pretty fast. Still, at least I can work full time again without struggling. And I’ve got more energy than a week ago – I’ve cooked dinner most days this week, without feeling exhausted immediately afterwards. So, apart from work, this week has been a mixed one. I had a hospital appointment on Weds morning, in which I was told I have irritable bowel syndrome as well as the endometriosis I already knew about. Hoorah! They aren’t prepared to do anything about it until after xmas, because apparently I can’t be considered to be healed from the surgery for another 2 months at least. It turns out, now I’ve done a little research, that I’m eligible for disability status, due to the severe and on-going pain. Seems weird really. Also on Weds, I made it to knitting in the library, after missing it last week. It was a busy meet-up this week – most of our regulars got there, and a new lady, Sue, who wants to come regularly and may bring along some colleagues as well. Sue works in the offices above the library, so it’s really convenient for her. It’s so small, it seems impossible that it could fit – every time he looks at it A is astonished all over again at how tiny this baby really is. I know what he means. I’ve decided to make a hat to go with it, which should hopefully only take a day or two. Then I’ll move on to my step-dad’s birthday bear. It looks like A’s jacket will have to wait until we get back from holiday. This coming week, I have a meeting with the boss-man and not a lot else planned really. Work is hectic, as it’s my main report development time of year, but I’m on top of it for now, I just have to keep up the pace for a while. Anyway, I’m off to get some housework done – a definite down-side to feeling so much better! 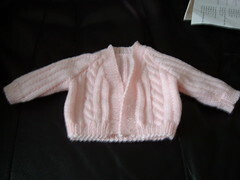 This entry was posted on September 26, 2009 at 9:28 am and is filed under knitting, Work. You can follow any responses to this entry through the RSS 2.0 feed. You can leave a response, or trackback from your own site.